Once Dead Lake Erie Back in Intensive Care for Phosphorus Problems? Lake Erie is often held up as an example of a once ‘dead’ ecosystem being resurrected. Legislative action such as the Clean Water Act and the Great Lakes Water Quality Agreement in the early 1970 addressed the causes of ‘death’ – huge algae blooms, oxygen deprived ‘dead zones’, and the devastating ecological results of these issues. Massive growth of aquatic vegetation, known as algae blooms, are caused by the excessive amounts of nutrients entering the lake. Once these huge swaths of algae die, they use tremendous amounts of oxygen to decay. And when they use up enough oxygen to cause levels of dissolved oxygen in the lake become too low for fish and other aquatic life to live there, these areas become dead zones due to their complete lack of life. One nutrient that plants, both land based and aquatic, love is phosphorus. Phosphorus can enter the lakes in a number of ways but in the 60s and 70s it was largely coming from household use of detergents with phosphates in them. The laws and agreements of the 70s stopped the use of phosphates and the release of them from sewage treatment plants. Slowly the algae blooms decreased, the dead zones disappeared, and the lake came back to life. Until a few years ago, that is. Beginning several years ago, massive algae began appearing again in the western basin of Lake Erie. This shallow end of the lake is surrounded by agricultural lands on both sides. Phosphorus appears to again be the cause of this explosion of algae but its source is different. Runoff from the agricultural use of phosphorus is the cause of this new trend. It is as if Lake Erie, a former cigarette smoker who has survived long cancer has switched to chewing tobacco and now is at risk of developing mouth cancer. A binational agency, the International Joint Commission, released a report (which can be found by clicking on this link: https://www.ijc.org/files/publications/2014%20IJC%20LEEP%20REPORT.pdf) this month making specific recommendation to help the lake deal with this re-emerging problem. These recommendations include declaring Lake Erie as an ‘impaired water’ on the shores of Michigan and Ohio therefore setting new limits for phosphorus. Additionally, the report looks at best management processes for reducing agricultural and urban runoff, how to increase monitoring of phosphorus in tributaries, and how to restore wetlands that play a key role in filtering pollution. And while the report mainly focuses on the western basin of Lake Erie and its main tributaries, the Maumee and Detroit Rivers, the issue of phosphorus fueled algae blooms, dead zones, and public health risks are not limited to that end of the lake. Near shore algae blooms are not uncommon in Western New York and have caused beach closures and stress on local ecosystems. As citizens of this area, it is important that we understand the dynamics of the lake, remember to make waterwise decisions like not using phosphate based fertilizers on our lawns, and to encourage our elected officials to continue to fund efforts to help restore important areas like wetlands. And as CSLs, you are playing a big role in understanding this problem by collecting data at your site on phosphates. If algae blooms continue to be a problem in Lake Erie in our eastern basin, the data you collect as part of Freshwater Watch and Adopt-a-Beach can help identity trends and conditions that lead to blooms. 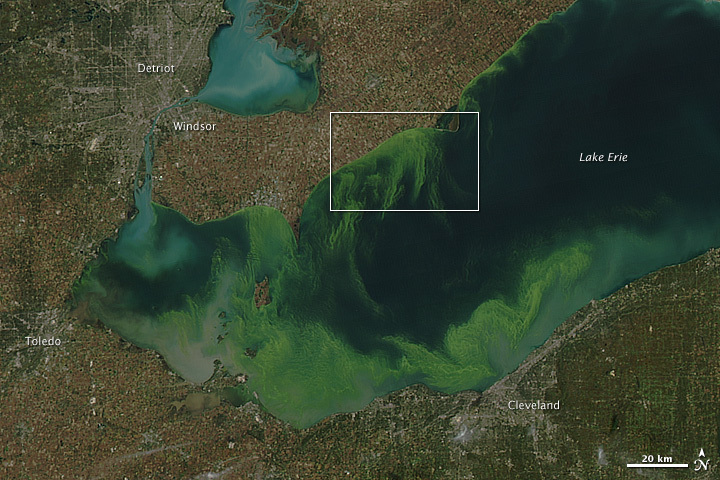 4 Comment(s) - Once Dead Lake Erie Back in Intensive Care for Phosphorus Problems? Thanks for posting this blog and sharing this information on Lake Erie! I think it's relevant for CSLs in Buffalo but also CSLs around the world as they realize the importance of collecting the phosphate data. I really enjoyed this concise and comprehensive history of Lake Erie and phosphates. It's a great example of why data collection is so important both locally and globally. Perfect write up and understandable - Thank you. Great for CSL in Buffalo, NY. Love this blog - thanks for sharing!